Recipe submitted by: Christine Peddy, Director, Building Brands with Wal-Mart, Unilever. Pack up and head to a park closer to home, with our picnic of Tuna Nicoise. Put the potatoes, beans, tuna, olives, tomatoes and lettuce in airtight containers. It's only minutes to assemble this one-dish buffet. 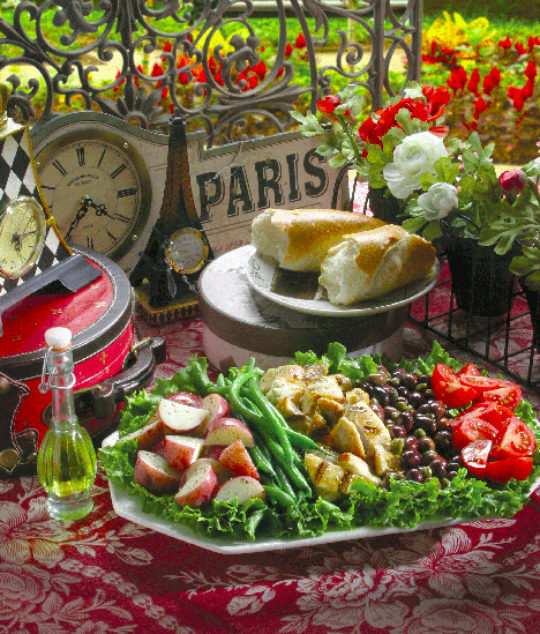 And, in no time, your picnickers will be dishing up some delicious French cuisine. Grill tuna steak over medium heat approximately 4 minutes per side, until steak begins to flake. Parboil or microwave green beans. Arrange all ingredients atop fresh greens. Sprinkle with dressing and serve immediately.